I was going to reply to another post and thought this is best as a new thread for people who are at that point in the decision process. Back in May of 2007 when it came time for my wife and I to decide on the exterior full body paint color, we really wanted to go green. Unfortunately at the time, any FB green pics available were of poor quality and under poor conditions. When we visited the factory, they only had a green lower body paint unit which did not appeal to us. We could not in clear conscience select the FB green. So we went with our second best choice, the FB gray, called Morning Mist. It is a good color that we like, but we were never head-over-heels in love with our decision. It took well over 2 years, nearly 3 years for me to find any decent quality pictures of a FB green PC on-line. I hesitated on showing them to my wife but did, and we jointly agreed that we should have taken the chance and gone with our gut feeling with the green. Oh well, gray "it is" for a very very long time, hopefully forever. We figure if our rig ever required a re-paint job for whatever reason, we would consider going green then. Our rig in forever Morning Mist gray. Here is the FB green we wished we had gambled on. Sorry to whoever's pic this is. I hope you don't mind me posting it here for all to see your beautiful green rig. The moral of this story is....don't be hasty. Search the web for other PCs of the same colors you might consider. You would really do your customers a service to have good quality pics of each color available as soon as the first unit is painted for the new model year. And not just "Mug" shots and distorted "Fish Eye" shots. Speaking from experience with selling Corvettes, picture quality, the angle, the distance from the vehicle, the lighting, all are a very big deal in capturing a potential customer. Hire a photographer if you need to, though it is very expensivee. If I lived near by, I'd offer to take the pictures for you. Applying a few simple tips would make a huge difference. What would sell a PC better? A picture like this, taken from far away? Or this, taken while standing way too close to the rig? It is nearly the same amount of work to get either one. I am not trying to be a nasty critic to PC-USA. I am trying to give them some constructive criticism, friendly advise to help them out. Just a little extra effort can yield great benefits. So Mr. Dittmer since when did you become an expert on advertising and photography? Please tell me where you got your education in these two fields. I see nothing wrong with the pictures currently displayed on the Phoenix home page and all the pictures for each and every model, both inside and outside. Would you please inform me of another manufacture that provides as many pictures and Phoenix does. Hi Tom, Everyone is entitled to their opinion, me to mine, and you to yours. And all is well except for my helpful rating number. I learned from experience in selling Corvettes over the years. Pictures are everything up to the point of getting a prospective buyer to see the car in person. Then the car sells itself. 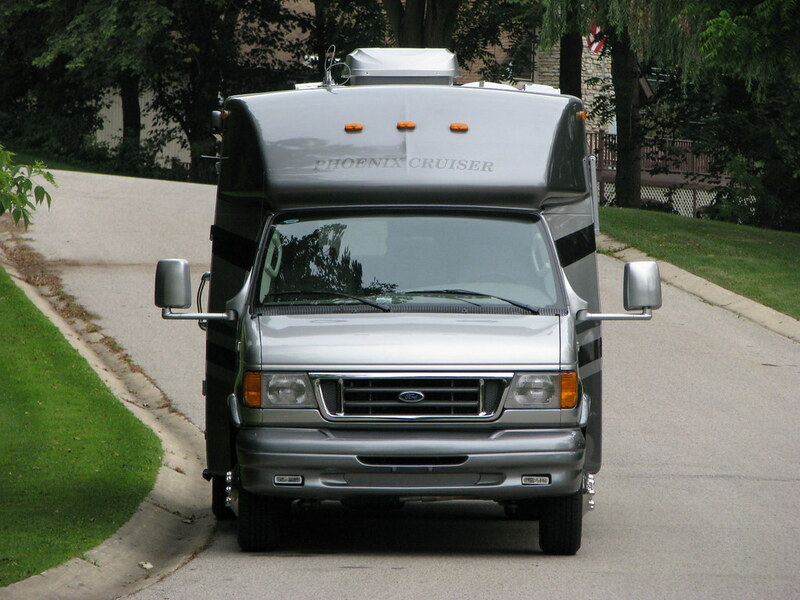 If the buyer can't physically see the car in-person (or in this case a motor home), then the pictures are all they have to go by. I only mean well. Maybe I'll have Aimee delete this if it becomes too contraversial. You are absolutley right about that. A hired professional could cost an arm and a leg. I use a $150 Canon 12x zoom, 8mp camera, a 6 foot ladder, a tripod, and 100 clicks and I've got plenty of pics to work with. And I almost never touch up anything. I am a novice that learned from many wrong ways on how to take a picture of a vehicle. I am just trying to share with the factory what I have learned. Me thinks you have gone too far in expressing your "OPINION"!! The real question is whether a PC is a functional way of touring the country in comfort or an objet d'art to express one's artistic tastes. I believe in the axiom "form follows function." I could not care less what the color and disigns on the side of my motorhome are but greatly care about how it drives, are the seats comfortable, does it have adequate power, are the beds a great place to sleep, is the kitchen suitable for cooking, etc. 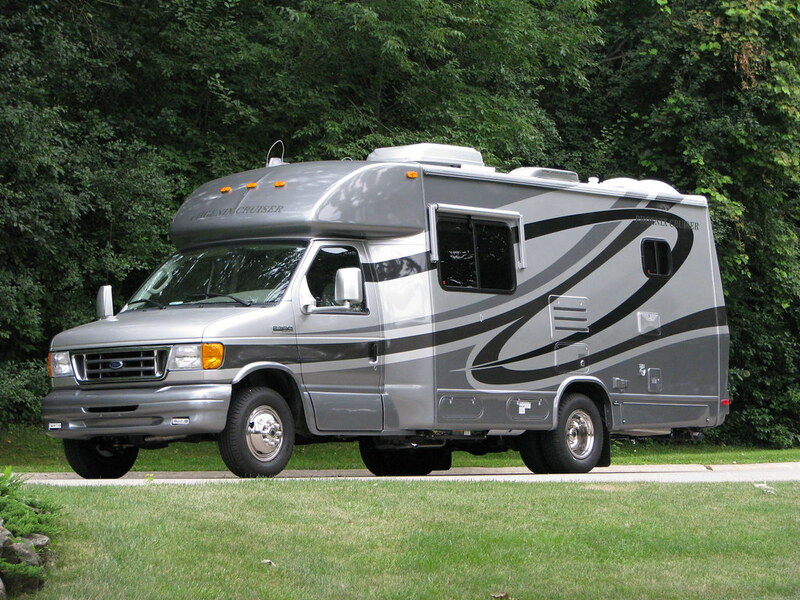 To me the prettiest RV's ever made were the all aluminum products made by Airstream that were finished in shiny aluminum. I plan to look out of my RV at the beautiful forests, lakes, and mountains, not look at the RV and admire what great taste I had in selecting the colors. That's just my outlook. It wasn't meant to be "Going Too Far". Maybe my input comes on too strong. I am just trying to give them some tips to help show their "Art-On-Wheels" better. If you study the bottom two pictures (the head-on shots) closely, compare the B+ caps. They are identical caps, but note the gray painted cap clearly shows it angling sideways to aero-dynamic sides. That picture clearly demonstrates how wonderfully aero-dynamic the PC truly is. The bottom-most head-on pic gives the illusion that the cap goes straight back without any aerodynamic properties. There is very little shown in the way of aerodynamics and over-all styling. The front bumper is wider than the rest of the rig. It is the result of taking the picture too close to the rig. Having the doors open doesn't help either. You will never see the doors open in an automotive brochure unless a model is present, or to bring out a very specific feature, say gull wing doors for example. The PC photographer needs to stand 50 to 70 feet away (even more is better yet), place his camera on a cheap $30 Walmart tripod, and zoom in. This avoids the distortion from the fish-eye effect. ISO settings need to be set lower as to avoid a grainy picture. Cheap 10x-20x zoom 6mp-12mp cameras all have such settings/adjustments. This is the kind of thing I am trying to bring out constructively, not insultingly. As can happen in forums, sometimes a point can be easily misunderstood, recieved harshly when in-fact it really meant very kindly. JimDenny, Please believe me when I say that I am intending to be very kind and constructive. Not a complaining critic with a strong opinion. The PC is very stylish and aerodynamic for a motor home. I am only trying to help the factory show it off better. I am of several minds about this. As a designer, I love beautiful photography with perfect perspective and ideal lighting and backgrounds. I'd love to be able to work up pages that would make your socks fall off and your drool hit the floor. As a small business owner who is chief cook and bottle washer, I can appreciate that Phoenix Cruiser runs a very tight ship to keep the bottom line affordable. This means just enough staff to cover every single thing that needs to be done, and not really any "down time" for anyone to take a unit to an attractive spot, wait for perfect lighting when they snap the photos. When a unit rolls off, whoever has the camera at the time runs out to take a photo of it right then. Otherwise, photos may simply never get a chance to be taken. Professional photography is not feasible for a few reasons--including that Phoenix doesn't build a lot of units to just sit around, so paying a photographer would involve paying for several sessions for him or her to come out after a unit is built, but before it is sold or taken to a show. As a consumer, I can appreciate that Phoenix Cruiser gives me a huge variety of photos and perspectives. You get to see just about every combination of colors and floorplans that they make, and you get the photos from the viewpoint of the person walking through the unit. I hate the "ears out" look of the photos with the doors open and the slides out and the cabinets all open, but customers love them. Time and again we get thank-you notes from people for letting them visualize the "how does that work? "'s of all the storage and slides, etc. As a web admin I also realize that no matter how much money Phoenix spends on photography, individual colors are going to display differently on each and every monitor depending on how long the monitor has been turned on, if it has any hot or cool spots, the personal settings a user has in store, etc. One of the most frustrating things for me is to take labored-over work and then look at it on some cockadoodie monitor that makes it look like crap (or even that makes it look different than it should in real life). I do know that there are many many times someone at the factory rushes out to take a few pics of something that's come off the line and then sends them to me to quickly put on the site because a potential customer is waiting to see them and wants to know, "how exactly does that work? how does this look?" etc. I didn't take Ron's post as bashing. He's a big PC cheerleader, and he does take great photos. I'd like to know where you got that camera for $150 and how I could get one. About 4 years ago Office Max had a sale on the Camon Powershot S5-iS for $150 and it included a free printer with a rebate. They were the last of the disposable Alkaline AA battery powered type. I think they were making room for the new models offered. Now-a-days the cameras all take special rechargables. My Powershot is old technology by today standards. Thanks Aimee for the explanation on how they opperate there....."Quick, take some pics for that customer!" Hey, I just looked on-line and see that same camera sells for more today than we paid back then. What's up with that? I should have bought out the store! Actually I am surprised to see it for sale at all. Yeah, my old camera was a powershot A640. It took amazing photos of everything from athletes in the air to running puppies. It finally gave up the ghost a few years back and I can't find a replacement for anything reasonable. I think that Ron raises valid points. I don't want to spend more on my next PC to support fancy photos, but we were surprised when we saw our FB Sterling PC. We selected the color based on catalog and website photos and seeing a lower body sterling unit. Full body paint is a major investment and it is everyone's interest to avoid surprises. I don't know if they have them available, but it would seem to me if purchasing a unit without having physically seen the color scheme, and if the color scheme matching your anticipated result is paramount, then would it be possible to request paint samples? Do auto makers do paint chip cards like house paints do? Can you get the paint #'s and see samples somewhere? As a graphic designer I can tell you that the only way to come close to ensuring an accurate color match is to do it in print using Pantone color codes and the cost is tremendous. First matching the exact shade is not easy and then when it comes time to print brochures or flyers, each individual color can be hundreds of dollars depending upon the printer doing the work. The printer must have specific types of printers and software which is capable of being calibrated for each color shade exactly instead of just mixing Cyan, Magenta, Yellow, and Black to get close. As I said in a previous post, there's no way to honestly even try to guarantee an accurate color representation on a monitor, which uses RGB color because each monitor will display color uniquely and the colors are created by mixing differing amounts of Red, Green, and Blue light to get the shades. There are many colors that cannot be replicated at all in CMYK (think a bright bright royal blue, for instance) which I can get beautifully on a monitor or can accomplish with Pantone color process. It is the nature of the beast. You can get a *general* idea of the colors and a pretty good idea of each color's relation to the others. Having your unit custom-built gives you more control over how your unit looks and functions. It isn't like buying one off the lot or a used unit where you didn't have a choice. I understand it can be frustrating to know that you had the choice and then wonder if you made the best one. Hopefully there's a way to have paint chips (which are printed using Pantone colors and are paid for by the paint companies) or have samples sent to those having a unit custom ordered so that it doesn't lead to disappointment. For the record, my all-time favorite PC color scheme was the blue they did back before I started doing the website. I agree with you Aimee on the whole subject of color. There is no practical method without color chips. And accurate chips might come at a hefty price of which has already been brought up. Many of the big auto manufactures offer a color chip brochure that covers the entire line-up. I don't know what the cost is associated in color accuracy, but it would be very helpful none-the-less in color selection for internet shoppers who order rigs sight-unseen. Back in the day when I was at the factory in 2007, the only pictures they offered were copies of rigs printed on office copy paper. Not even photographic paper. Those printer copies were poor as well. It was real tough back then to make a choice. The only good quality picture of any kind was only one, a gray one on their 2007 brochure. When we visited that day, there was a FB blue/blue-gray and a FB brown/bronze one. Given our interior color selection, I thought the brown/bronze was worth consideration but my wife would have no part of it. Of coarse the factory today has gotten much better since those days, or so I hope. We have not been back since we picked ours up in 2007. When I see the pictures on their website today, I think a little more effort (and I do mean just a little more) in picture taking would go a long way for customers to work with. That was my point in all this. Unfortunately my point seemed to come across offensively to some. I can be a bit strong in my choice of words without even realizing it. Anyhow, here an example of a color chip brochure for those who don't know what you and I are referring to. Yes I am familiar with the paint chip samples. Each color is a different pantone ink cartridge. They cannot be printed from a digital printer and so the printer must use their offset machine to print. Each color must first be established with absolute accuracy, and then must be ordered by the printer from Pantone. Prices depend upon the type of color. Regular colors are the cheapest (but not cheap). Metallics are more expensive than regular. Most of ours would fall into Metallics. 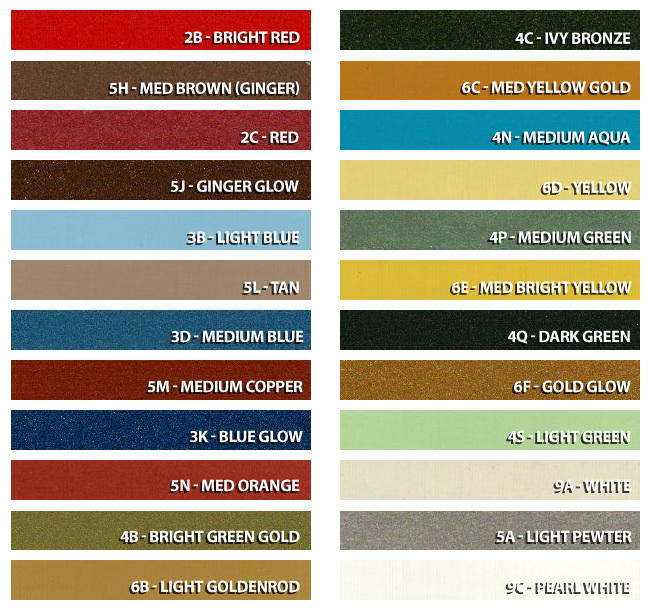 Flourescents are more expensive than Metallics, and X2 colors (must be run twice through the machine each time a color is used) is obviously the most expensive. Some of ours would fall into this category, but not most. Then for every color that uses Pantone or Spot color on the page, the paper has to go through the printer a separate time. This is cost-effective for companies that are producing thousands of vehicles or selling hundreds of thousands of cans or bottles of paint each year. It's also cost-effective for companies who do not change their color options frequently. My suggestion is that if you feel you must know the exact shade of paint you're getting before you get it, you request the paint code #'s and contact the manufacturer of the paint for a sample. It would be awesome if we produced enough units for sale each year that the cost of printing these up would be easily offset by individual customer purchases. Every magazine I know of converts Pantone or Spot color to CMYK process, however, so people making decisions based off of what they saw in magazines, etc. would still end up with slightly off colors. Ahhhh the wonderful world of "That's not how it's supposed to look!" Welcome to my world.